Elizabeth City State University (ECSU) is a state-supported, coed, four-year college, founded in 189…. 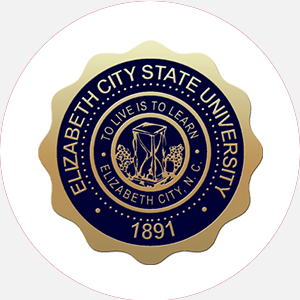 Elizabeth City State University (ECSU) is a state-supported, coed, four-year college, founded in 1891 as the Elizabeth State Colored Normal School. Secondary-level instruction was offered until 1937. The name changed to Elizabeth City State Teachers College in 1939, awarding its first baccalaureate degrees. To more accurately reflect the growth in programs, the school’s name changed to Elizabeth City State College in 1963 and Elizabeth City State University in 1969. ECSU is one of sixteen bodies of higher education that make up the University of North Carolina System. Originally, the University’s mission was to serve minorities, while today the University serves to educate an increasingly multicultural student body. The school also endeavors to identify and address the needs of the northeastern region of the state, with particular attention to economic development. The campus has forty-one buildings and is located on approximately 856 acres, of which approximately 87 acres represent the campus proper, 68 acres comprise the former farm, 639 acres are reserved for educational research, and 35 acres comprise landholding designed for residential or expansion purposes. A golf driving range, a nature trail for outdoor classroom, and tennis courts are also located on the campus. Elizabeth City State University is accredited by the Southern Association of Colleges and Schools (SACS) to award the Bachelor of Arts and the Bachelor of Science degrees. Percentage of students receiving financial aid:90 Financial Aid Specific to the School American Indian Student Legislative Grants: Award up to 0 to students who establish that they are Native American and demonstrate financial need. Students should contact the school. Army ROTC, in cooperation with Norfolk State University and North Carolina State University, offers two-year and four-year scholarships that pay tuition, fees, books, and other expenses and provide a monthly stipend. Students should contact the ROTC Office on either campus. High school graduation (or equivalent) with a 2.0 GPA and 12 units including 4 English, 3 mathematics (including geometry, algebra I, and algebra II), 2 social studies (including U.S. history and government and economics), 3 science (including physical science, biology, and one laboratory course); 2 years of high school foreign language recommended and 1 year of mathematics in twelfth grade; a complete recent physical. A nonrefundable application fee is required. Admission Application Deadline: August 1 (fall); December 1 (spring). Rolling admission provides no specific date for notification of admission. The applicant is informed as soon as the admission decision is made. Admission Contact: Office of Admissions, Campus Box 901, Elizabeth City State University, 1704 Weeksville Road, Elizabeth City, North Carolina 27909; Telephone: 252-335-3305 or 800-347-3278 (toll-free). A minimum of 129 semester hours and completion of core courses, including one foreign language, three mathematics, three science, and one computer course for some majors; GPA of 2.0 for all students; a 30-hour residency requirement. Teacher education students are required to have a 2.5 GPA and to pass the National Teachers Examination Core Battery I and II. Campus Services: Health center, personal and psychological counseling, testing center, remedial instruction, and religious activities. Campus Activities: Six honor and recognition societies are active on the ECSU campus. National Greek sororities include Alpha Kappa Alpha, Delta Sigma Theta, Sigma Gamma Rho, and Zeta Phi Beta; fraternities include Alpha Phi Alpha, Kappa Alpha Psi, Omega Psi Phi, and Phi Beta Sigma. One service fraternity, one service sorority, and eight social fellowships have chapters on campus. The Student Government Association offers campus governance involvement and attends to student needs and development. The United Campus Religious Fellowship (UCRF) is active in promoting non-denominational religious events for the University community. A number of University publications are available for student participation. A student-run FM radio station is active on campus. Several music organizations, including marching and concert bands, jazz band, University choir, and gospel choir, are available to all enrolled students. Housing Availability 1,031 housing spaces are available, with 255 designated for freshmen only. Students are strongly encouraged to live on campus.